Previous Post: Visit, Live, Retire in Bermuda Next Post: Volunteering in retirement: A win for mind, body, soul… and more! English expat in Italy enjoying all that the boot has to offer. Check out Francesca's Mix Oil and Water website. I wouldn’t be surprised if you hadn’t heard of Abruzzo. I certainly hardly knew of its existence before one particularly torrid, sticky Roman summer. Fed up of staying indoors all day to escape the heat and the frayed nerves of the Romans, my boyfriend and I were looking for an escape route. We dreamed of mountain air, refreshing walks in shady woods, using a blanket at night instead of tossing and turning in sweaty sheets. And so we got out the map and found the highest up, but closest possible refuge. Our refuge was Abruzzo. We packed a few things and were off along the motorway. Half an hour later we were out of the city suburbs, driving through green hills dotted with the odd town. Soon after that the hills become small verdant mountains, and towns and villages were balanced precariously on ridges, or nestled in valleys. The temperature dropped a few degrees, and we rolled down the windows, the fresh air waking our sluggish brains. We went through a long gallery and as we came out of the other side we gasped in delight as massive, brooding mountains loomed up all around us. Gone were the friendly, wooded mountains. Now we were surrounded by sheer grey rock faces, peaks beyond peaks, changing shape and dimension as we drove on into the heart of this magical mountain region. An hour later we were at our bed and breakfast, listening to the stream below our window and gazing out at the awesome scenery. We had only traveled a couple of hours to get here but it felt like another world, and we set off eagerly to explore. Arriving at the local beauty spot, a picnic area at the bottom of a wooded hill, we found scenes of bucolic Sunday contentedness. Families were lazing around after communal picnics, their bottles of wine and water cooling in the fountains that brought fresh stream water down from the mountains. We set off up the trail that led to the top of the hill and soon realized we perhaps weren’t quite prepared for this mountain-walking business, as well-lunched pensioners and children alike overtook us as we struggled, breathless, along the path. Puffing and panting we eventually made it to the top where we were surprised to find a lone chapel overlooking the hills below. We cheekily rang the bell, listening to it echoing over the valley, then lay in a patch of shade and promptly fell asleep. The next day, after a refreshing sleep, we woke to strange noises outside the bedroom door. Creeping outside we found a fragrant, steaming cake sitting on the table outside. We looked at each other questioningly, before realizing we were the only ones staying at the bed and breakfast, and digging greedily in. Later we met the bed and breakfast owner down the street, and asked about the cake. He shrugged casually, explaining that his daughter lived nearby and he’d asked her to make us a cake as a welcome token. So that explained the strange noises in the early morning! We thanked him profusely and set off for another day’s adventure. Our destination was a village with a castle on the other side of the mountain. We soon realized we were hopelessly lost and stopped at a petrol station to ask for directions. The petrol station attendant gazed with puzzlement at our map before calling over a friend from the bar next door. He also gazed in confusion at the map, before calling over another friend. Soon we had a group of five men abandoning their game of cards and coming to our aid (or rather my Italian boyfriend’s aid, as their dialect was far too thick for me with my rudimentary grasp of mainstream Italian to understand). Huddled over the map on the bonnet of our car an action plan was agreed on by all, and repeating the complicated instructions to ourselves we set off once again. Needless to say, in such an untamed and mountainous region it’s easy to get lost, and we certainly continued to get well and truly lost that morning despite the intense and repeated instructions of our bar helpers. On the other hand if we hadn’t gone over the wrong bit of the mountain we wouldn’t have run into bad weather, and we wouldn’t have experienced the spectacle of driving through a cloud patch in the middle of a beech forest and felt the eerie, magical sensation that we were the only ones around for miles and miles. We wouldn’t have arrived past lunchtime at the castle and therefore wouldn’t have had the chance to eat our sandwiches at the castle window, overlooking the high fast-moving clouds. 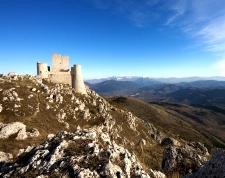 Abruzzo is full of surprises and full of genuine people who are happy to welcome visitors who are prepared to come with an open mind and heart. Try visiting, you won’t regret it. We are planning to move to the Abruzzo area Feb. 2017for 2 years. My husband will be 65, I will be 62. We need help in finding a furnished rental and all the info necessary needed for residence, insurance, etc.